zarinahtakesapaycut: PwC is hiding fraud, here is the evidence! On the 28th of April 2009, the Securities Commission charged the engagement partner of Roger Yue, Tan & Associates for abetting a listed company in submitting false information (inflated earnings) to Bursa Malaysia. Who will hire an Auditing firm known and charged for releasing false information, in this case inflated earnings(something Enron was famous for), a tainted firm, as their own Auditors? This is who, Chin Kwai Fatt & Co, a gallery of 'rogues' in PwC! 1. 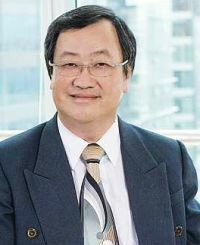 Mr Chin Kwai Fatt, the Managing Director of PricewaterhouseCoopers Malaysia, the largest auditing firm in this country. Mr Chin is the man who controls PwC Malaysia. 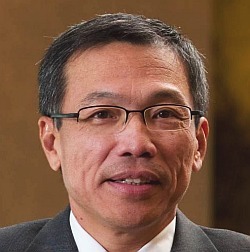 Mr Chin, who went to Tan Sri Zarinah Anwar's, the Chairman of the Securities Commission, home for dinner, and got his man appointed as the Director of the Audit Oversight Board, is also very close to the firm of Roger Yue, Tan & Associates. Mr Chin Kwai Fatt, MD of PwC Malaysia. 2. 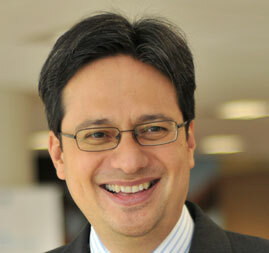 Dato' Johan Raslan, the Executive Chairman of PricewaterhouseCoopers Malaysia. A man who follows what Mr Chin Kwai Fatt asks of him. 3. Mr Lee Tuck Heng, Senior Partner in PricewaterhouseCoopers Malaysia. Mr Lee Tuck Heng, seated third from left. 4. Mr Khoo Chuan Keat, Tax Leader and Senior Executive Director in PricewaterhouseCoopers Malaysia. 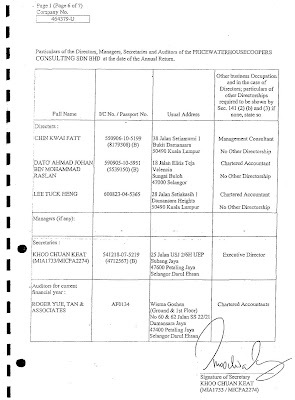 Roger Yue, Tan & Associates are the auditors for PricewaterhouseCoopers Consulting Sdn Bhd (464379-U), the company which is under the directorship of Mr Chin Kwai Fatt, Dato' Johan Raslan, Mr Lee Tuck Heng and Mr Khoo Chuan Keat as the Secretary. 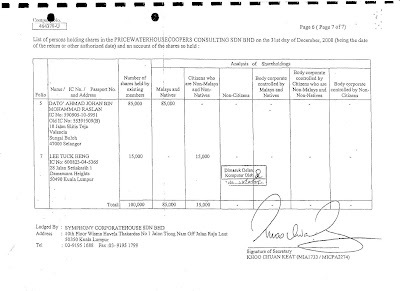 PricewaterhouseCoopers Consulting Sdn Bhd (464379-U), whose Directors are Mr Chin Kwai Fatt, Dato Johan Raslan and Mr Lee Tuck Heng, with Mr Khoo Chuan Keat as its Secretary, are using a tainted firm as their own Auditors. The Shareholders for PricewaterhouseCoopers Consulting Sdn Bhd are Dato' Johan Raslan and Mr Lee Tuck Heng, with Mr Khoo Chuan Keat signing off as the Secretary. Why would the largest Auditing Firm in the country, PwC Malaysia, which does the audits for more than a hundred public listed companies and many important corporations, have Senior Partners, Chin Kwai Fatt & Co, who use the services of an auditor who has been charged by the SC for clear cut fraud, as their own Auditors.? Wouldn't it be expected that the biggest auditing firm in the country will only use the auditing services of untainted auditors for any and all of their businesses? Unless....there is something that they need hidden perhaps? 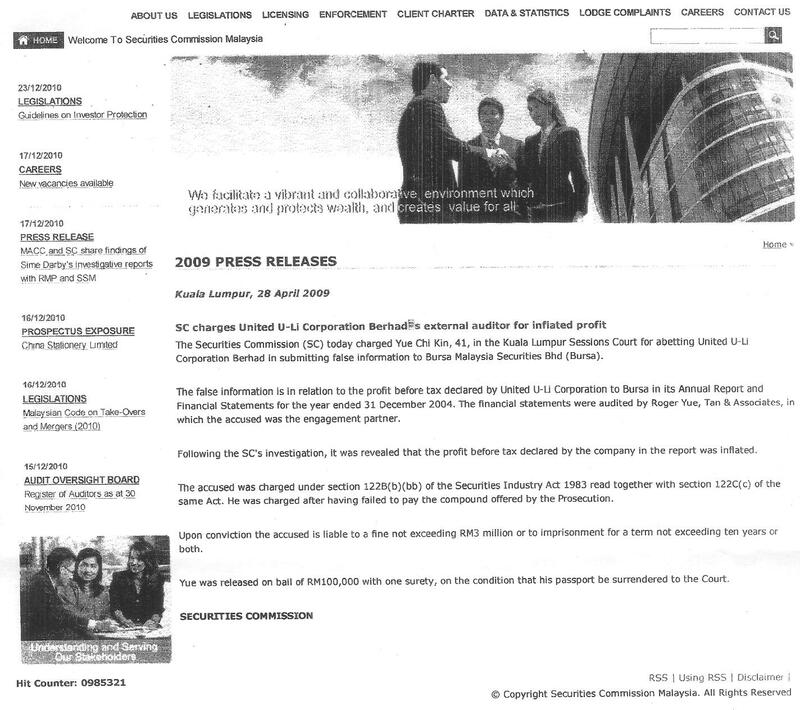 There is an ongoing fraud perpetrated by PwC in Malaysia with regards to the non disposal of PricewaterhouseCoopers Consulting Sdn Bhd (464379-U) to IBM Corp, when PricewaterhouseCoopers LLP sold its global management consulting and technology services business to IBM Corp back in 2002. ﻿The sale of the Consulting Business to IBM Corp was a lock, stock and barrel deal, which meant that all ongoing businesses, assets and liabilities were sold to IBM Corp for USD$ 3.5 billion in 2002. 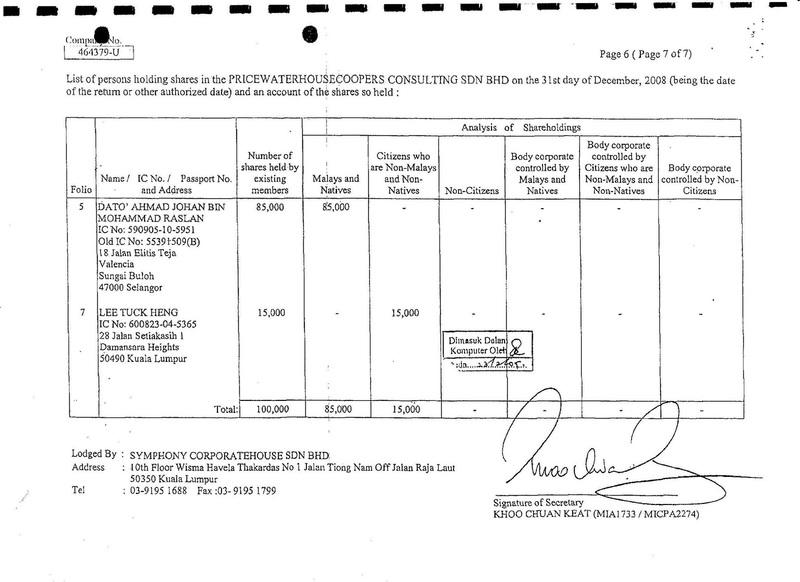 In Malaysia though, PricewaterhouseCoopers Consulting Sdn Bhd (464379-U), was not disposed off to IBM, and still remains in existence to hide contingent liabilities to the tune of several hundred million Ringgit. You can read more about this ongoing fraud by PwC Malaysia here. 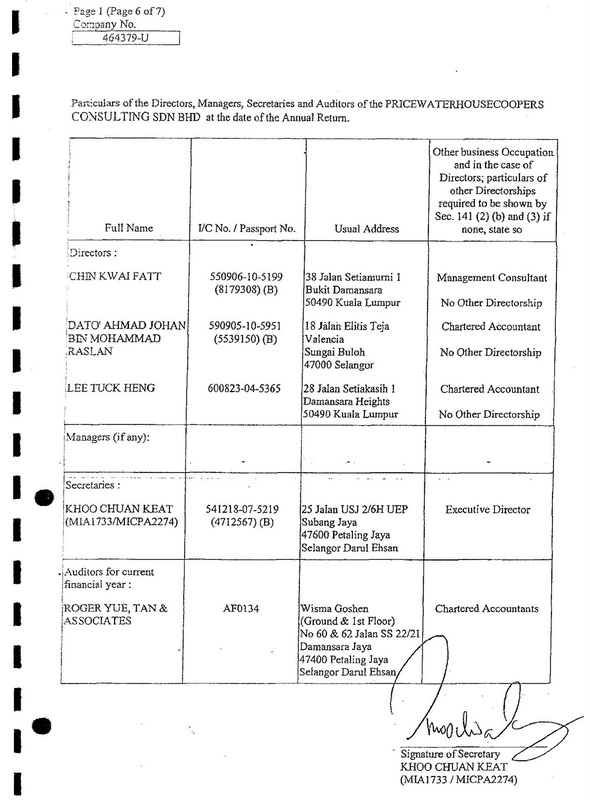 Under the directorship of this four senior partners, Chin Kwai Fatt & Co, PricewaterhouseCoopers Consulting Sdn Bhd (464379-U), has remained unmolested and happily hiding all these liabilities for more than 8 years. But the Directors would not be able to use the services of any normal, upright and honest Auditors would they? Chin Kwai fatt & Co will need the help of someone that will be willing to help them perpetrate this ongoing fraud, defrauding creditors and all, and that is exactly what they have done. The firm was charged with offences related to inflated profits, and they are now helping you hide your liabilities. Why would the four of you, Chin & Co, use tainted auditors, for goodness sake? The only reason you are using this tainted auditors is to cover up your fraudulent acts. We have further irrefutable evidence of fraud by Chin Kwai Fatt & Co. We will release the evidence bit by bit over time. Mr Chin Kwai Fatt, we give you until the end of February to dissolve PricewaterhouseCoopers Consulting Sdn Bhd (464379-U) and for once and for all, put a stop to this continuing fraud. Just put up a posting in support. I put up a posting to link to this. what is there to hope anymore?